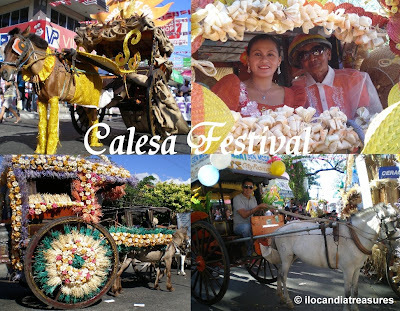 There is a total of 283 calesas in the city and 58 of them were decorated to parade around town. They were decorated mostly with indigenous materials such as leaves, flowers dried and fresh. Some of the calesas were sponsored by some business establishments and showcased their product. One local product I have seen was the sukang iloco. As I approached their calesa I was given and tried their suka with some slice turnips. The vinegar was so pure and strong. It was made from the fermented sugarcane juice mixed with samak fruit and leaves. Another calesa was decorated with mango leaves and fruits. The ripe and the green ones placed in baskets. So tempting to eat but that was just for display. Longganisa and garlic were also showcased being hanged in one of the calesas. The sinking bell tower was also showcased in one of the decorations. It’s the emblem of Laoag City. One of the horses was dressed up and another has put on wings. The wheels were decorated with flowers and the symbol sunshine. The parade was just amazing. I even got a free ride since I interviewed the kutsero.